We try every year to watch the Macy’s Thanksgiving Day Parade on TV. Sometimes we’re able to see the whole thing and other years we see bits and pieces. I’ve been watching it ever since I was a child and I love to pass the fun along to my girls. This year we learned a little about the history of the parade and the man who originally created the concept of the balloons with the book Balloons Over Broadway. Then, we made our own Thanksgiving craft by making our own parade balloons. Once you’re done with this fun craft, you can find more Thanksgiving crafts for kids here. Disclaimer: This post contains Amazon Affiliate and other affiliate links. Please see my disclosure for more details. 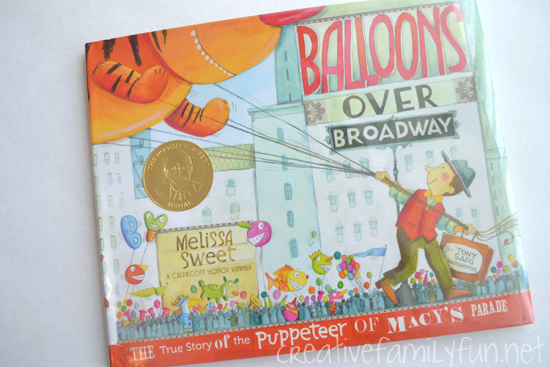 The inspiration for our project came from this wonderful book, Balloons Over Broadway: The True Story of the Puppeteer of Macy’s Parade by Melissa Sweet. It’s a fun and fascinating book about Tony Sarg, a puppeteer who created the concept for the balloons you see every year in the Macy’s Thanksgiving Day Parade. Since we were talking about the parade balloons, we gathered supplied to make our own versions. I blew up a balloon for each of the girls and brought out tape, markers, and construction paper. Clear tape is the best way to attach your construction paper. Glue will just make everything slip and slide and will never stick well. My girls loved the excuse to play with tape. But be warned, don’t peel tape off the balloon. It could pop! We cut embellishments from our construction paper. My oldest made a tiara and necklace for her princess and my youngest cut ears and a mane for her horse. Use the permanent markers to add details. Don’t use washable markers on your balloon, they will just smear and come off on your hands. 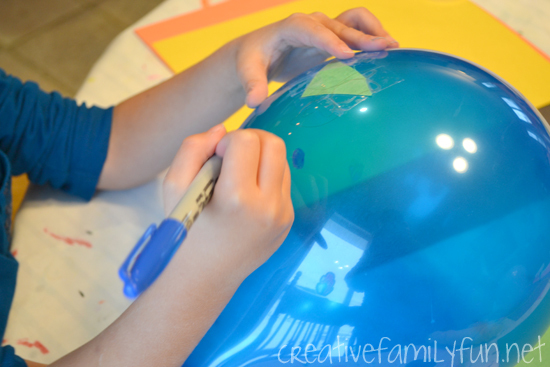 The permanent markers will smear if you touch it before it dries, but once it’s dry, it will stay on the balloon. We had one balloon pop because we were pressing down too hard with the marker, so use a light hand with your markers. 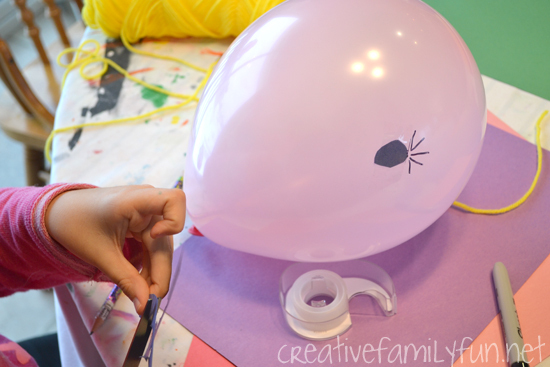 Once your balloons are finished attach string so you can hang it or carry it around. 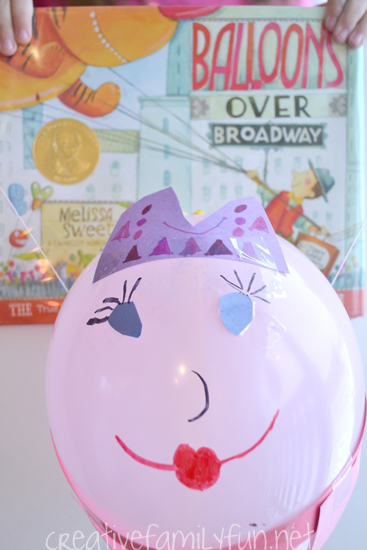 We had a ton of fun making our parade balloons inspired by Balloons Over Broadway. 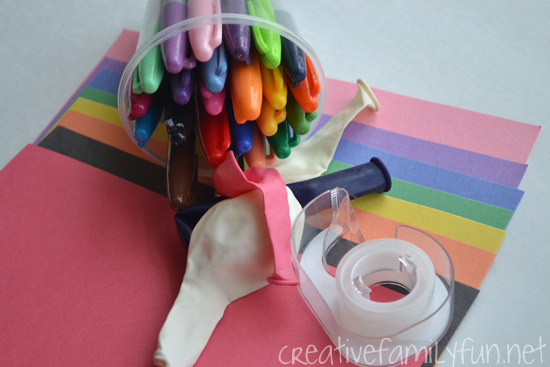 This is a fun 3-D art project and you can turn your balloons into just about anything. Use your imagination and have fun. Have your own parade when you’re finished and enjoy this mini family adventure. Prep Time: Five to ten minutes to gather supplies. Make plans to purchase or stop by the library to find the book, Balloons Over Broadway. 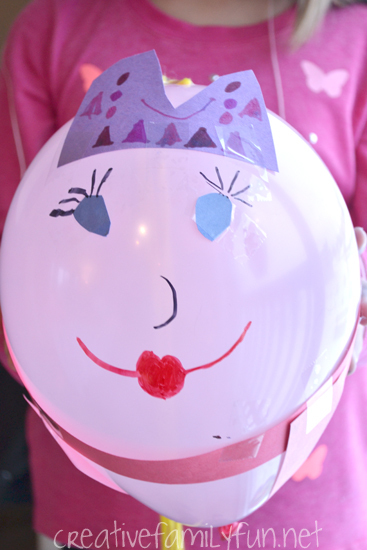 Gather around the table and let everyone create their own parade balloon. Round out the family adventure by letting your kids hold their own Thanksgiving parade.